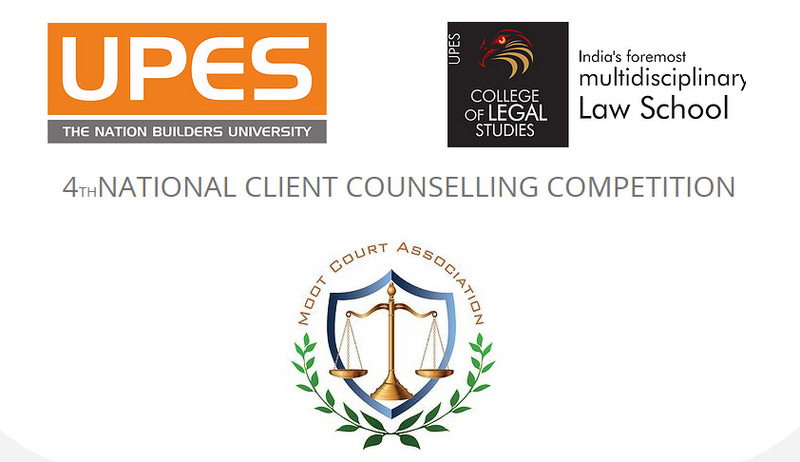 University Of Petroleum & Energy Studies is organizing its 4th National Client Counselling Competition. Registration of the participating teams for this competition shall be done by sending a mail at upes.clientcounselling@gmail.com with a scanned copy of the filled registration form, duly attached before 7th October 2015. The registration fee via NEFT must be made before 10th October 2015. Thereafter, the participants would receive a confirmation mail of their registration, then only any team would be registered. Registration fee: Rs.3,000/- per team. Hard copy of the registration form shall be submitted at the time of Registration. Team comprising of two students from your esteemed Institution for this competition. (upes.clientcounselling@gmail.com) with duly filled soft copy of registration form before 7th October, 2015. 3.Participation is limited to legal fraternity. 4.Only 24 teams will be selected on first come first serve basis and only one application would be accepted from one university or college. The discipline and transparency with which this competition was conducted has contributed in its previous successful chapters leading to an increased participation from year to year since its inception. 1) Each team shall consist of two student participants and would be allotted a room for the interview and counselling. Here the two student participants will present themselves as advocates in a lawyer's chamber. The client will be a person trained by the organisers and the advocates will counsel the clients regarding the given problem. The two participants are required to elicit all relevant information from the client by interviewing or questioning the client and then counsel the client. 2) All teams will be given their tag numbers as (A1, A2, A3 etc.) by the organisers at the time of registration. 3) The Consultation (Interview Period). All teams will go through a 20 minutes session in prelims and a 35 minutes session each in semi-final and final rounds. The first 15 minutes in Prelim and 25 minutes finals are devoted to a consultation with the client during which students are expected to elicit the relevant information, outline the problem and propose a solution or other means of resolving the problem (Further information is contained in the Judging Standards for the Client Counselling Competition.) During the consultation and post-consultation, the team may use books, notes and other materials. The team may also use office props (Dictaphones, Files, desktop, furnishings, bookshelves etc.) and any other material to furnish their consultation room. 4) Post Consultation (Post Interview Period). During the last 5 minutes in Prelim and 15 minutes in finals post-consultation the students may either talk to each other loudly enough to be overheard by the judges or dictate a file memorandum on the interview or both. The post-consultation performance may summarize the interview, indicate the scope of the legal work to be undertaken, and state the legal issues that should be researched. Explanation of the position or attitude taken by the students may be useful. Judges may questions during the post consultation period. 5) If the students feel that some documents are appropriate, like a letter to the client confirming their retention as attorneys, the fee arrangement etc, or a letter to opposing counsel or to the party with whom the client is having their legal problems, they may dictate such a document at the post consultation stage. 6) The Judges may penalize students who allow the interview session to run excessively beyond the 15/ 25 minute period allotted in the rules. However the judges in their discretion, taking into account the circumstances, may allow some more time beyond the 15/ 25 minute period for the interview session. If the extended consultation session allowed an opportunity for a team to gather more information than other teams, this circumstance should be taken into consideration by the judges in making their decision. If the twenty-five (25)/fifteen (15) minute interview period is exceeded, in no circumstances will the students be given more than 40 minutes to complete both tasks (Consultation & Post Consultation). Judges should stop students after 40/25 minutes regardless of whether the students are in the consultation or post-consultation process. 7) There will be four rounds namely -the preliminary, quarter final, semi-final and final rounds. From the preliminary rounds, 16 teams would go for Quarters, depending on the number of participants, with the highest number of points that will be qualified to participate in the semi-final round. After the judges have seen all the teams’ performance, they should discuss each team's performance among themselves. Judges are encouraged to consult the client. The judges can discuss with the teams regarding their performance. 1) Each law school/College may enter this competition with one team only. Each team shall consist of two students. 2) Dress Code- Formal Moot Court Dress. No participant should reveal his or her identity in any way. 3) Students pursuing Law (3 year or 5 year course) courses are only permitted to participate in the competition. Students pursuing Post-graduate courses in law are not permitted to participate in this competition. 4) All the problems will be based on the subjects of Constitution of India, Torts, Contract Law, Indian Penal Code, and Family Law. Each team, in the preliminary rounds, will have a total of 20 minutes. First 15 minutes is termed as “Client Consultation period”. The participants are expected to extract the relevant information, make an outline of the problem and make legal suggestions for its resolution. Last 5 minutes is termed as “Post Interview period”. The participants shall discuss the interview with the judges. The participants are to use this time to assess the interview and discuss future strategies for dealing with the client's problems. 6) It is on the discretion of the teams to decide, “How will they share the work?” The work plan is subject to judging. However, the teams may use a part of this post interview period to explain their work plan. The judges may question the teams during this period. Last 15 minutes for post consultation period. After all the teams have finished their respective sessions, the judges in each group shall privately consult in order to evaluate the teams. Clients may, at this time, be invited to participate in the judges’ consultation period. However, his/her opinion shall not be determinative. In order to preserve anonymity, each team will be identified by an Alpha-numeric code, which will be provided to each team during registration process. Disclosing the name of the participating college to the judges will result in a 5 mark penalty. Observers may watch any interview session but shall not be permitted to communicate with any other participating team. Scouting is prohibited and will result in a 5 mark penalty. Each group will be judged by a panel of one or two judges. Each panel of judges may be from among the following categories: Practicing Lawyers, Academicians, Judges, Counsellors, and Psychologists. The Judges and the teams shall agree beforehand to the starting time of the interview. Once the Preliminary rounds starts, the participating teams shall not indulge in any form of conversation with the clients (outside of their rounds). Such a conversation will be considered as misconduct and the teams so interacting shall be disqualified. 13) Each judge will evaluate for a maximum of 100 marks independently. The scores of all the judges for each team will be added and then listed according to the team scores (best team scoring highest points). In the order of merit, the top eight teams from the Preliminary rounds will enter the Semi-Final Round. If there is a tie for the 8th position, one of the teams scoring the same marks for the 8th position will be eligible to go to the semifinals on the basis of marks scored according to the Point 5 of the Judging Standards. If a tie still persists, the last resort would be draw of lots for finalization of winning team. The same rule shall apply for promotion from Quarter Finals to Semi Finals and from Semi Finals to Finals for the top 4 and 2 teams respectively. I.The teams entering the Semi-Finals will be notified as soon as possible. The Organizers reserve the authority to resolve any dispute or decide any other issue pertaining to the rules of this Competition and their decision shall be final for all the participants.